The best merch-in-action photo ever. 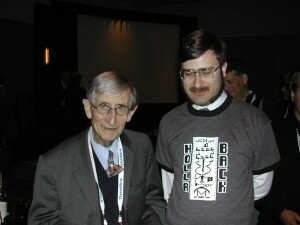 TAZ reader and all around-peach pcornelius, with Freeman Dyson at the International Space Development Conference. You know Freeman Dyson, don’t you? The Dyson Sphere guy. He is kind of a big deal. Thanks so much for sending this t’me, pcornelius! Posted on June 29, 2010 July 2, 2010 Author IronSpikeCategories Announcement4 Comments on The best merch-in-action photo ever.